Once you taste home-cured olives, there is no way you can go back to the bought ones, even the fancy olives from the deli. Not to mention the fact that they are much MUCH cheaper! (Between $3 and $5/kg, compared to $20-25/kg in a deli). M. has been curing olives for a year now and every batch is only getting better and better. He first started with a 5kg box of olives from the Ashfield Fruit &Veg shop, then another one, and then expanded his operation with another 10kg box from Flemington markets, which you can see on the picture below. 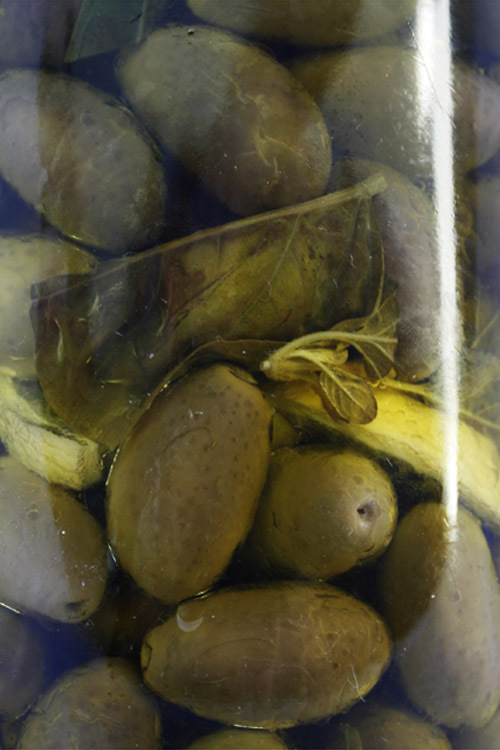 There are several methods for pickling olives, and each will affect flavour, texture and pickling speed differently. This makes it quite interesting, as you can play with the varied methods according to the desired outcome. The first step which will determine the texture and the speed of the pickling process is how to treat the olives themselves. You can indeed use them as is, or slit them with a knife, or even bruise them with a hammer. These two last options will speed up the process considerably, as they will help the brine get through the flesh quicker. M. opts for the hammer this time and smashes the olives one by one before placing them in a big plastic jar. 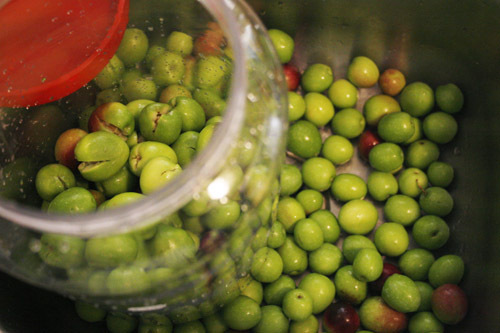 The second step is to decide on the composition of the brine in which the olives are going to be stored. You can use salted water (1 part salt for 10 parts water), water with vinegar, or just plain water. 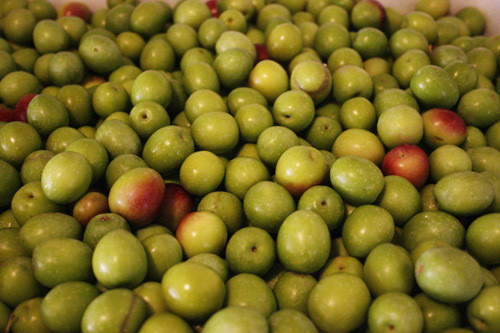 Each produces a different result, conferring to the olives their distinct flavour. For this batch, M. chooses fresh water, which he will then have to change every day for a week to avoid the formation of bacteria. He then switches to a mixture of water and vinegar (white wine vinegar) for the following weeks. Vinegar, like salt, keeps bacteria from developing. 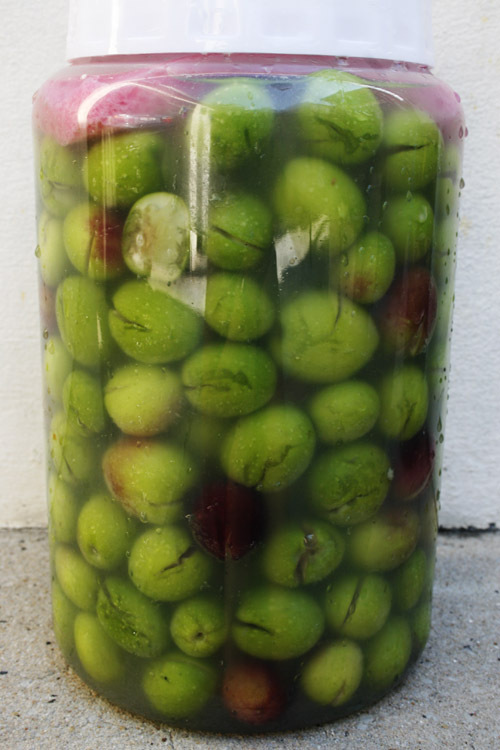 Unlike salted water, which needs to be changed regularly (otherwise it becomes a bit disgusting), the vinegar & water brine can be kept until the olives are ready. The olives have to be fully submerged at all times (with a cloth / small dish). This batch took around 8 weeks for the olives to lose their bitterness and be tasty. 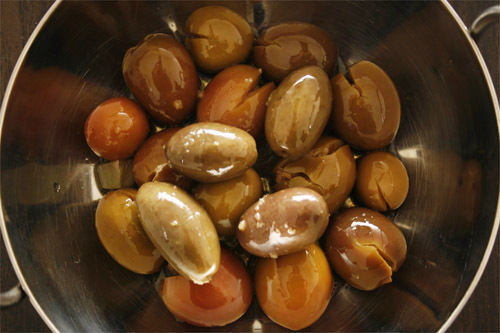 Other batches with salted water can take less time, as the more you change the water, the quicker the olives cure. There is however no definitive way to cure olives, everyone has their own little tricks and there are many different techniques that can be found all over the internet. M. uses a combination of all of these and a recipe from Movida / Frank Camorra’s cookbook, as well as the rule of thumb, by tasting the olives every now and again and then deciding when they are ready. He then fills them with olive oil, so that they can keep for a long time. Above is a jar from a previous batch of giant Kalamata olives, not smashed and seasoned with lemon, garlic and basil… what can I say… they are just bloody delicious! This entry was posted in Recipes and tagged Curing, Kalamata, Manzanilla, Olives, Pickling, Recipe. Bookmark the permalink. How long did M take to smash the 10kg ? The olives look very appetising ! Bravo ! @Suze @Anna The smashing of olives is quite fun, but not as good to express your inner anger, as you still need to have some control to not smash your fingers! @Franny He didn’t smash the whole 10kg on the same day, it would have taken hours otherwise! 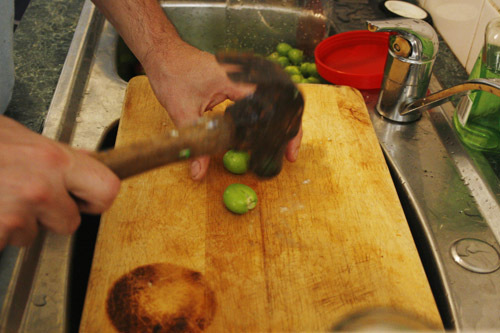 wow smashing each olive with a hammer.. that’s true dedication… looks yum though. Looks like fun. My wife and I did this a few years ago. I made the mistake of not wearing an apron. The juices and oils from the olives make permanent stains – be careful. I recently started doing my own dry cured olives. Check out our blog to see the progress. I posted today, and will post again once the process is done – I have no idea how long it’ll take. Hello Lynne, thank you for your question.